Star Trek: Asterisk "Officer's Lounge - Tomorrow's Arena is Yesterday's Court Martial"
Eep Opp Ork Ah-Ah! That means I love you guys! So much so, that I've got this week's live broadcast portion ready for you to hear! This week, Steve and I continue our adventures in Federation space with a handful of episodes from The Original Series - "Arena", "Tomorrow is Yesterday", and "Court Martial". Point your LCARS console here to access the hilarity. 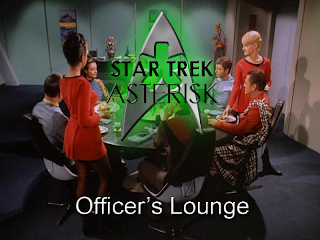 Also, be sure to stick around for the Aftermath later this weekend, along with Steve's written reviews, all of which you can find by following @GreenAsterisk on Twitter, and keeping an eye on the #StarTrekAsterisk hashtag. Plus, we'll be broadcasting again next Thursday, 6PM Eastern - same bat time, same bat channel. Now cue up your Netflix app and ENGAGE!